With Fall upon us I am so excited to dress Mila up in adorable sweaters. Babies look so cute in cardigans and sweaters! Below you can find these sweet fall sweaters for baby girl to wear this Fall. This Fox Print sweater is adorable! I love the knitted fox with flowers in her hair and it totally says Autumn. We need to get this for Mila because she adores her fox stuffed animal. I love this unique nature sweater! Great for the outdoor enthusiasts with a baby girl who joins them on their fun adventures. There is a little squirrel, leaves, a chickadee bird and flowers beautifully embroidered on it, how cute! A darling red horse knit sweater for the baby who loves horses. Such a sweet sweater and even better it is made of environmentally friendly organic cotton! I love everything about this baby cardigan. It is a pretty teal color and has such beautiful embroidered flowers, fawn, bird and little mouse, how sweet! What a beautiful and unique baby sweater dress. The bird pockets are so pretty, as is the knit design on the top! This is sure to keep your baby girl warm this Fall and into Winter, paired with some leggings. Simple, yet classy this mustard cardigan totally reads Fall. The embroidered pink flowers along the edges are really elegant. This is the perfect piece to have as a layer for your baby this season. This cardigan is gorgeous! It features two knitted koala bears along with other intricate designs that would definitely look cute on any baby wearing it. This could also be worn by a baby boy as it has a neutral design. What a cute little cat sweater! I love all of the embroidered flowers on the kitty’s head along with variety of colors on the trim and sleeves. I’m a fan of Fair Isle knits and this cute sweater for baby has lots of fun intricate shapes and designs. Pretty embroidered flowers stand out on this navy blue cardigan. This is a nice piece to have in baby’s fall wardrobe to mix and match with other pieces. This is a timeless piece that will match with everything in baby’s fall wardrobe! The crochet is so pretty and it looks both cute and comfortable. This chevron knit sweater is adorable! I love the pink and orange color combination, the chevron pattern and especially the attached knit flower. 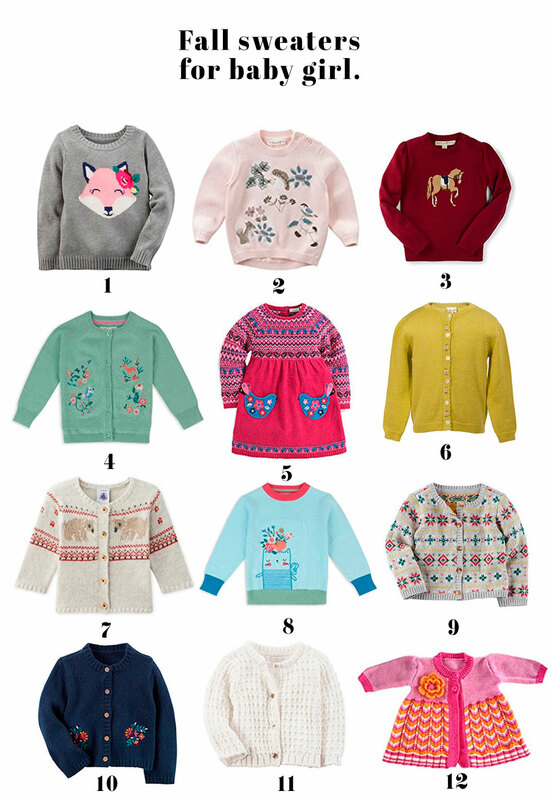 Which baby sweater is your favorite? We are having a … girl!